Welcome to our ultimate online guide to blackjack. It's one of the most popular casino games in the world–in the United States it's second in popularity only to slot machines–and it's also one of the most entertaining and cheapest gambling experiences you can have. It has an undeniable mystique because of the popularity of card counting and other advantage player techniques. 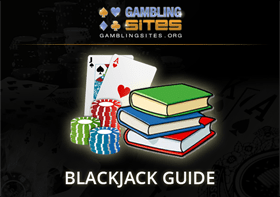 The purpose of this guide is to provide you with the most complete and detailed guide to blackjack, online and off, that you could ask for. The goal is to be comprehensive, and to cater for everyone from those who have never played blackjack before to experienced players who are looking to learn about advanced aspects of the game. Our guide is divided into the following sections. This page consists of a broad overview of blackjack, including details about the history of the game, some basics of how it's played, and what kinds of strategies can help you reduce the casino's edge. It also serves as an introduction to each of the above sections, explaining in more detail about what they cover. The additional pages within those sections go into exhaustive detail about a wide range of subtopics. For the purposes of this broad overview, we'll assume you know next to nothing about the game of blackjack. It actually has a fascinating history, even though its actual origins are lost. The earliest mention of blackjack that historians have been able to find is in Don Quixote from Miguel de Cervantes. A couple of the characters are gambling cheats who play a game called ventiuna. If you speak Spanish, you’ll recognize that word as "21". This early version of blackjack was played with a special deck that had the 8s, 9s, and 10s removed. Since Don Quixote was written in the early 1600s, the game–or at least its precursor–is at least 400 and maybe even 500 years old. The story of how 21 became blackjack is of interest, too. Early casinos offered a bonus payout of 10 to 1 any time a player got an ace of spades along with any black jack–clubs or spades. The hand was called blackjack and now that’s also the name of the game. Blackjack is one of the easiest casino games to play. The modern version uses a regular deck of cards. Suits are ignored. The cards each have a point value which is equal to the card's rank, as illustrated below. Players (and the dealer) begin with an initial two card hand. They have the opportunity to take additional cards or stand on their current total. If their total exceeds 21, they bust. If they get a total of less than or equal to 21 and also have a higher total than the dealer, then they win. If the dealer gets a higher total, or if the player busts, the player loses their money. The players play against the dealer, not each other. It's possible for one player to win with a total of 20 and another player to win with a total of 18, because they're comparing their hands to the dealer's–not to each other's. In fact, let us suggest now that you get started by playing online blackjack. You can get a feel for the game using free software that you can download from any reputable Internet casino. Or you can play free games in your browser window. If you enjoy the game, you can move on to making a deposit and playing for real money, but do a little homework first. Online gambling isn't legal in every jurisdiction. Some casinos ignore legal restrictions that might limit a player from the United States in his quest for this kind of entertainment. Even though we recommend obeying the laws of your jurisdiction, you can find someone to take your action if you definitely want to play for real money online. You can read more about online blackjack for USA players within this section of our guide. If you decide to play at an Internet casino, it's important to take into account the business's reputation. Not all Internet casinos, especially those that accept players from the United States, are honest. Stick with the recommended casinos on this site if you want to avoid getting ripped off. The choices you have available on the Internet are staggering. Most websites who offer blackjack allow you to download an entire package of casino games that you can play for real money. They'll invariably include at least one version of blackjack, but often they'll include multiple variations with different rules. If you don't like downloading software, you can still play online using your browser window. These no download games can be a great way to decide whether or not you like to play. They're also one of the best opportunities you have to practice before going into the casino. A lot of casinos are now mobile friendly, which means you can play from your cell phone or your tablet, too. A lot of players also enjoy playing blackjack with a live dealer via Webcam. One aspect of blackjack online that you should be aware of is your inability to get an edge over the casino. You can't count cards on the Internet. The software shuffles the cards every hand, eliminating any edge you might have gotten. Even the Webcam casinos with the live dealers shuffle after every hand. This section of our blackjack guide covers everything you could possibly want to know about playing blackjack at online casinos. It includes pages on each of the following. Here are some very basic tips and some advice for new players. Once you've tried out the game online and figured out how the action works, it's time to start thinking about the rules of the game. You can find a detailed explanation on the appropriate page, but here are some general rules to keep in mind. Those are your only choices. If you're playing online, you'll just click the appropriate button. In a live, brick-and-mortar casino, you'll signal with your hands or just say what you want to do. Our page on the rules covers how the hand signals work. The rules vary from casino to casino. Some of these rules variations are just limitations on what you can and can't do with your hand. In some casinos, you can "double down" on any two cards. That means you take one–and only one–additional card while simultaneously doubling the size of your bet. But in other casinos, you’re only allowed to double down on a total of 9, 10, or 11. Other rule variations are more elaborate, like playing with both dealer's cards face up. These types of rules variations usually warrant a new name being given to the game, like Super Fun 21 or Spanish blackjack. One of the most exciting things about this game is that your decisions matter. There's a mathematically correct decision for every situation. Even if you don't know all the ins and outs of strategy, you can still reduce the house's advantage over you significantly by just playing intelligently. The beginners section of our blackjack guide is the ideal place to start if you are new to the game. The following pages are all included. Once you get past the beginner stage, it's time to start thinking about some of the complexities of the game. This includes what the correct playing decisions are, how the odds and probability work, and whether or not you want to learn how to count cards. Most casinos sell cards with the correct blackjack decisions on them, but rules variations can change the correct strategy in certain situations. But a lot of the guidelines of basic strategy are almost common sense. For example, it doesn't take a math professor to know you should always stand on a total of 20. It also doesn't take a rocket scientist to realize you should also always hit a total of nine. The reason that you can ascertain the correct decision in every situation is because the odds are calculable. All the variables in blackjack are known. A deck of cards has 52 individual cards in them. You'll never run into a deck with five aces, so the ratios and probabilities are known quantities. The math behind blackjack odds and probability is just one of the many topics covered in the intermediate section of our blackjack guide. There are plenty of other pages as well that will help you to learn more about this game. Imagine you're playing roulette. There are 38 slots on a roulette wheel, so your odds of getting any individual outcome are 37 to 1. But what if once the ball landed on a spot it stayed there? And it was impossible to hit that number again until the croupier hit a reset button of some kind? The odds change. Instead of having a 37 to 1 shot, you now have a 36 to 1 shot. As each number gets taken, the slot is filled, and your odds keep improving. Eventually you'll have an edge over the house, because a single number bet pays out at 35 to 1. Once your odds become 34 to 1 of winning that bet, you're in a profitable situation. As those odds continue to improve, so does your edge. Wouldn't it make sense to bet less when all the slots were available and more when they got filled in? Unfortunately, games of roulette don't have a memory in that way. Once a card is dealt, it's gone from the shoe until the dealer hits the "reset button" by shuffling the deck. What this means to the player is that if they keep an eye on the ratio of high cards to low cards, they can raise their bets when the deck has a relatively large number of high cards. The aces and tens improve a player's chances because they increase the odds of getting a "natural" on the first two cards. A natural, or a "blackjack", is a 2 card hand consisting of a ten and an ace, which automatically has a total of 21. This bet pays the player 3 to 2 instead of even money. If the player has a better chance of being dealt this kind of hand, they can raise their bets accordingly and get an edge over the casino. And it doesn't take a genius to count cards, either. You don't need a photographic memory. The aces and 10s are assigned a point value for the purposes of counting cards, and so are the low cards (usually the threes, fours, fives, and sixes). By tracking those points, a player can get an idea of the ratio of high cards to low cards in the deck. Another way to get an edge is to notice when high cards or low cards come in "clumps". They tend to stay in those clumps even when shuffled, so you can raise your bets when a favorable clump is coming due. This is called shuffle tracking. You can even get an edge by exploiting sloppy dealers. We'd never encourage anyone to cheat at blackjack. For one thing, it's illegal. For another, it's unnecessary. But if a dealer is sloppy enough to show me their hole card, we're going to look. And some dealers have "tells", nonverbal clues to their hole card, just like poker players. The advanced section of this guide features detailed instructions about all of these advantage play techniques outlined above. You can find all kinds of resources to help you become a better player. Reading books is a good place to start. We like Arnold Snyder's Big Book of Blackjack, but we offer reviews of a couple dozen blackjack books in this section of the guide. Blackjack even has its own set of professional players who are more-or-less superstars. Many of these players have written books or become famous, but their stories are interesting in and of themselves. The Blackjack Hall of Fame is an informal organization which honors thinkers who contribute to the world of blackjack knowledge. Most skilled players are anonymous because of the casinos' attitude toward advantage play. But you can still learn a lot from those players who have "gone public". Blackjack is the king of table games in the casino world, especially in the United States. It's easy and fun to learn, especially if you get started online. The broad overview on this page is meant as an introduction to the game for beginners. Please take the time to visit the other parts of this guide for more detailed treatments of more specific subtopics. Remember, one of the great things about blackjack is that the nature of the game creates an opportunity to use your skills to reduce the house's advantage over you. If you want to take your game to the next level, you can even get an edge over the casino by learning to count cards. And that's just one example of advantage play in blackjack.